Once we were finished sheltering ourselves from the windstorm, we could finally make our way North to the small Islands that sit off Corfu. This is really the furthest North we could go without leaving Greece. The wind forecast was for light Southerlies, dying off during the night. Or so it said. 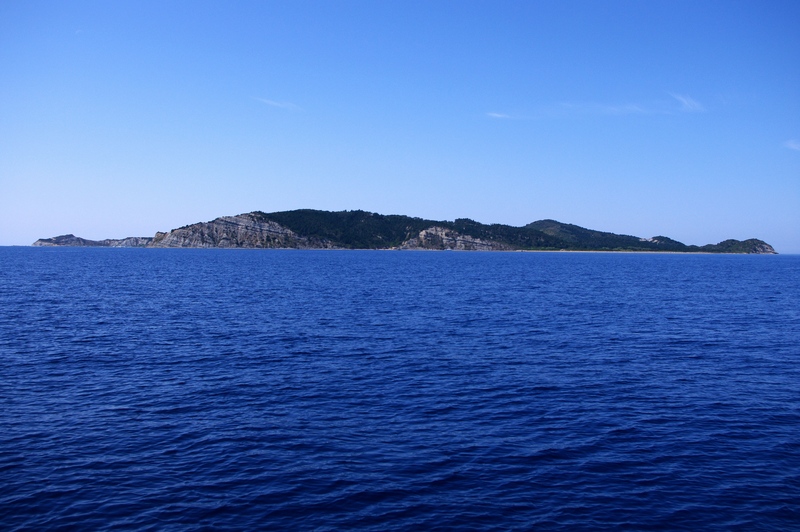 Our first stop was Nisos Erikousa, which was the closest in distance 23.5 nautical miles away. We motor-sailed there, with winds from behind. They slowly turned to the prevailing North Westerly direction, making our stop in the South anchorage more comfortable. The harbor was quite large and fairly shallow, so we decided to anchor right in the middle of it, rather than out next to the other anchored boats. That allowed for some protection provided by the rock wall, should Southerly winds come in. It was a nice introduction to the islands. The bay was mostly a beach, backed by a few buildings, including a hotel and some beautiful homes. At the end was their electricity generating plant. It was an extremely peaceful stop. We enjoyed a dinner at the local hotel/restaurant, looking out towards the beach and the anchored yachts. The waiter told us that 12 people live on the island full time (including winter). 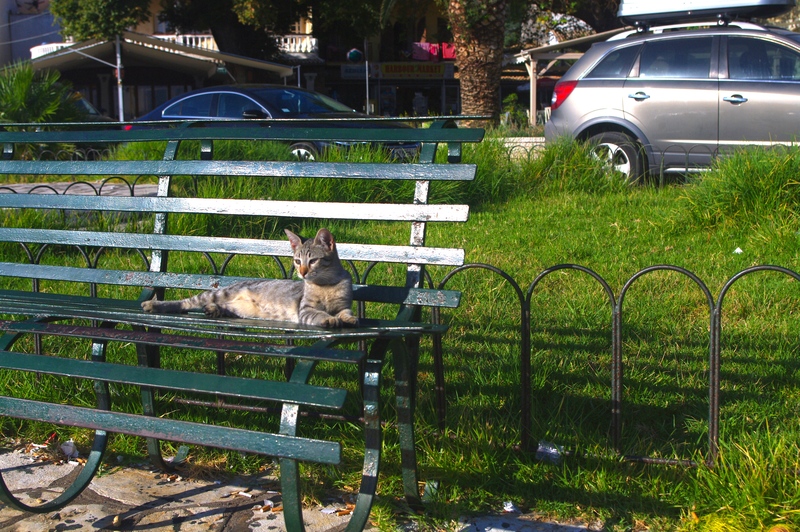 During the summer months, there are more residents to cater for the tourist crowd. If you want to call it that. We were pleased at how quiet the place was, but the waiter indicated that it was a difficult summer for them. The islands are a stopping point for boats coming to Greece from Italy, which is only 40 nautical miles away. In previous years they had up to 60 boats anchored in the bay at a time. On that particular night, there were maybe 12 boats. 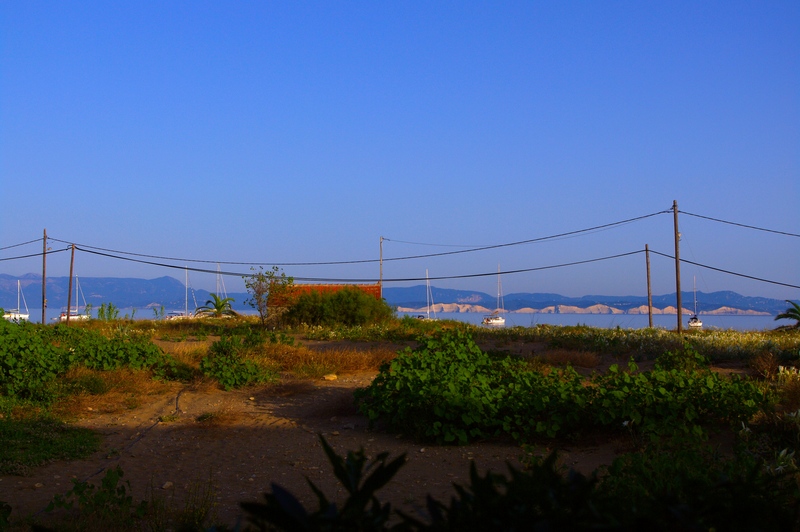 In the morning we were woken up by the wind coming from the South East, blowing straight into the harbor. It was not strong, but enough to have us notice it, so we took off towards Nisos Othoni. The winds slowly turned to the South West, but not with enough angle to allow us to sail during the 8.5 nautical mile trip. There we had a choice, and could have gone to the Northern anchorage, which would have been totally protected from the South. Given the wind had defied the forecast the night before, we thought we would stay near the town in the Southern anchorage with the hope that the wind turned North West. On our arrival, it was blowing straight into the bay, making it rather rolly. There were only about 6 boats in total there, most of which were making their way over to Italy. The wind did not change, and it continued blowing in that direction for the rest of the night. We enjoyed a dinner of fresh fried squid under some beach huts, watching over the bay. At this point, the dinghy also decided to lose its air, especially when the air cooled down. It was quite cold, and extremely humid as soon as the sun went down. The dinghy basically wanted to fold in half as we were rowing it back to the boat. We tried to find use the pump, but it did not have the right connection to plug in. Some days later we managed to make the hose plug in to pump up the dingy, which was lucky because we had guests on board. Anyway, after enjoying a rolly and windy night in that bay (the winds increased rather than decreased) we set off to Nisos Mathraki 6.5 nautical miles away. 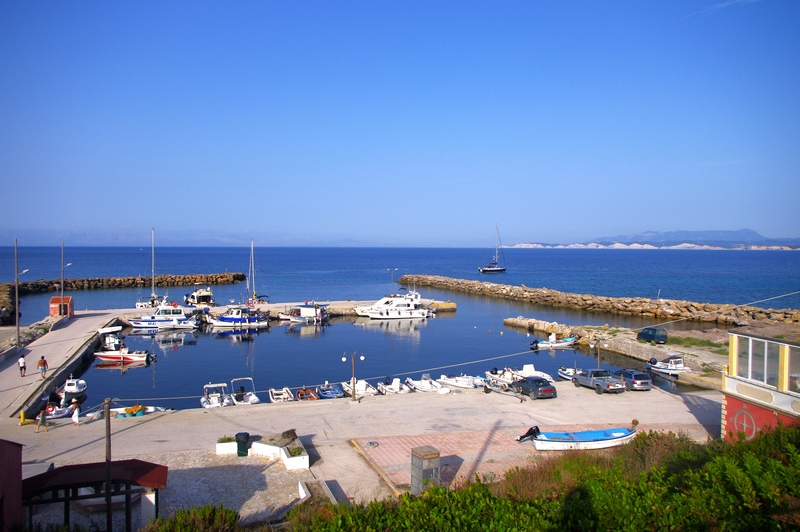 We had hope for protection, because the (very) small harbor was only open to the North East. Wrong. The swell wrapped nicely around the harbor walls, created a large surge inside the harbor. We did not have much other choice so had to stay there. In one sense, I’m glad that we did because we enjoyed a marvelous meal at the Dolphins restaurant overlooking the harbor. Ryan tried a local corfu beer, made by a micro brewery and without any preservatives. It was a good result. 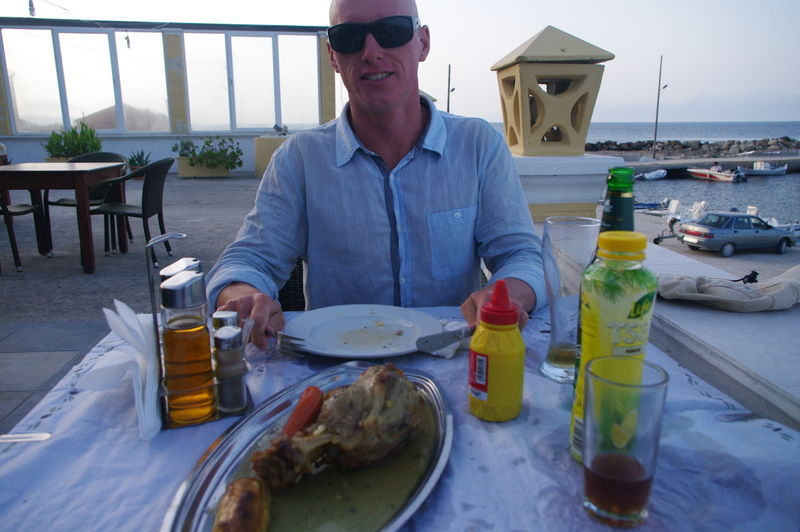 The Taverna owner told us about the specials of the day, which included slow roasted pork leg for 2 people. We ordered that, and were delighted at the deliciousness. So delighted in fact that we ordered a second serving for 2 people followed by their complimentary watermelon. After eating enough food for 4 people, we rolled ourselves back to the boat, where the surge coming into the harbor made using the plank to get back on the boat quite an adventure. It took some careful timing, but we made it. Again, the winds picked up during the night and the surge felt like we were sailing in a huge swell. The boat bounced back and forth between the anchor and the mooring lines. I was certain the anchor would either give way, or the anchor lock would loosen and let it go. Luckily neither of those happened and the boat survived the night, with two very tired people on board. There were only 3 other boats tied to the quay. One had left before we even got out of bed, and another moved into the fishing harbor as soon as they could, taking up the space of a local fishing boat. The wind was still blowing from the South in the morning, so we were quick to get away, in the hope that it would keep blowing. We started out great, with the wind beam on. 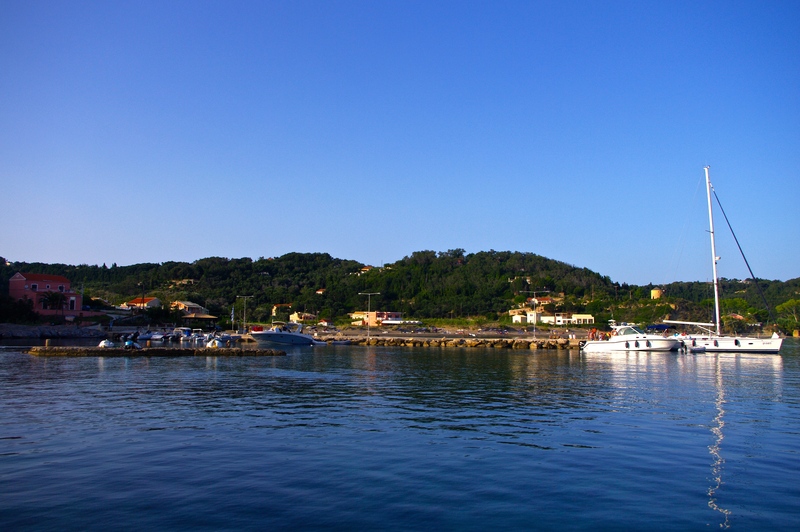 As we reached the Northern tip of Corfu, it died off a bit. It then curved around the top of the island, making it come straight from the back, which meant it was spinnaker time! We enjoyed a sail with the spinnaker for a short while, until the wind turned too far to the North so we motored the rest of the way to Kassiopi. 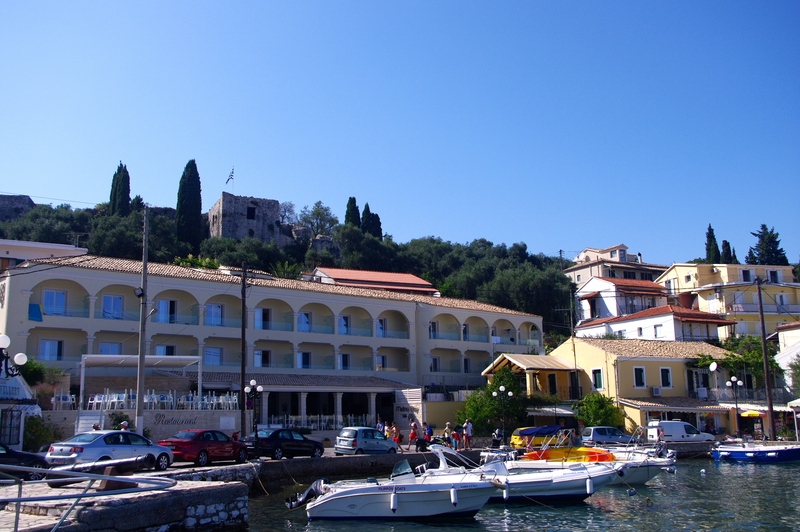 Kassiopi is a quaint seaside village on the North side of Corfu. The harbor is set under a beautiful old venetian castle. Being in a catamaran, we were able to go bows to the town quay in a spot where others could not go. Only small daytrip motorboats could go as shallow as us. 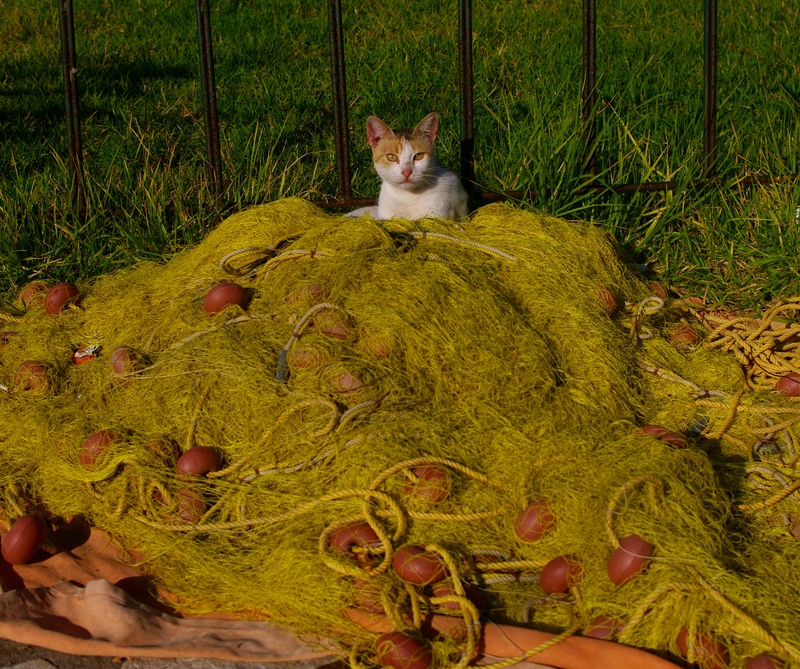 This is where three cats decided they wanted to make Sibia their home. As soon as the plank hit the quay, their paws were already making their way on board. I spotted them and shoo’d them away. As long as the plank was there, they were going to make attempts to get on. So we just had to get rid of the plank. It’s lucky we spotted them, otherwise I don’t know what we would have done. We went for drinks in the evening at Wave Bar, on the Western side of the harbor. The meals coming out looked amazing so we decided to eat there. Although they looked good, the meals were below average. After dinner it was cool enough to go for a walk around town, and spy on the black motor yacht that we had seen in Gaios, and was also in Kassiopi. As we walked past, the owner and his young female guest sat on the back watching the crowd go past sipping drinks. He seemed important. As we walked past again, we started guessing who he could possibly be. Just as we were having a laugh, talking about how he was probably Mr Versace himself, a sweet English lady sitting down at a Taverna told us excitedly that it was Roberto Cavalli, the famous fashion designer. That gave us a bit of a laugh, and kicked off a night of drinks with Gail and Graham, whilst Gail nervously thought about asking Mr Cavalli for a photo. Others were jumping on board and having photos with him. He certainly wasn’t shying away from the crowd. He even had a giant set of binoculars to look at women walking past on the boardwalk. My guess was to see what fashion brands they were wearing…. Ryan’s guess was otherwise. Gail did not end up getting her photo, because it did not take long for the Italian crowd to surround his boat. The crowd became thick and keen, so Mr Cavalli retreated inside the boat, and then left, with many people following him. He seemed nice enough, stopping along the way for photos. 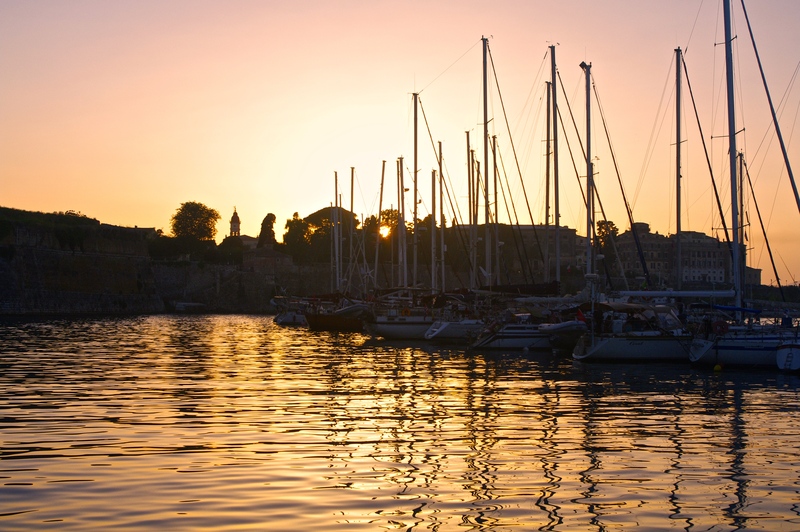 After spending the evening bonding with Gail and Graham over celebrity encounters, we invited them along to sail to Corfu town the next morning. They appeared to be delighted to come along, and at 10am the next day we welcomed them aboard. Unfortunately the wind did not play nice, and we had to motor all the way. That did not seem to sway their enjoyment of the experience. It was also nice for us to have another couple to chat to along the way. 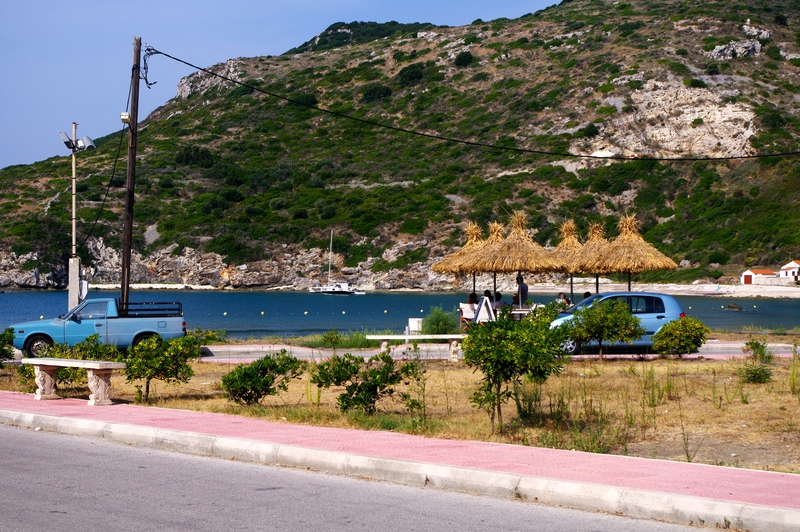 We left Gail and Graham at our favourite marina, Mandraki, underneath the old fort. That night my father and his wife were arriving from Switzerland. We had time to clean up the boat a bit, although the water kept turning off. We even had proper showers, so did not smell too badly for our guests. That evening before their arrival we ate at the restaurant attached to the marina. Their food was fabulous, and the grilled squid to die for! 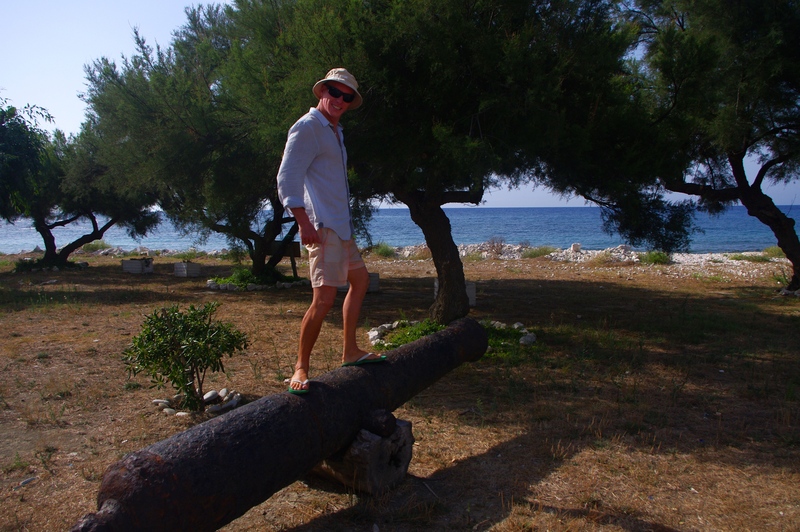 Our aim was to get our guests further South, to show them some of the best spots the Ionian had to offer. With only a week on board, we knew we would not get them everywhere. Of course, our first stop heading South from Corfu had to be Lakka. 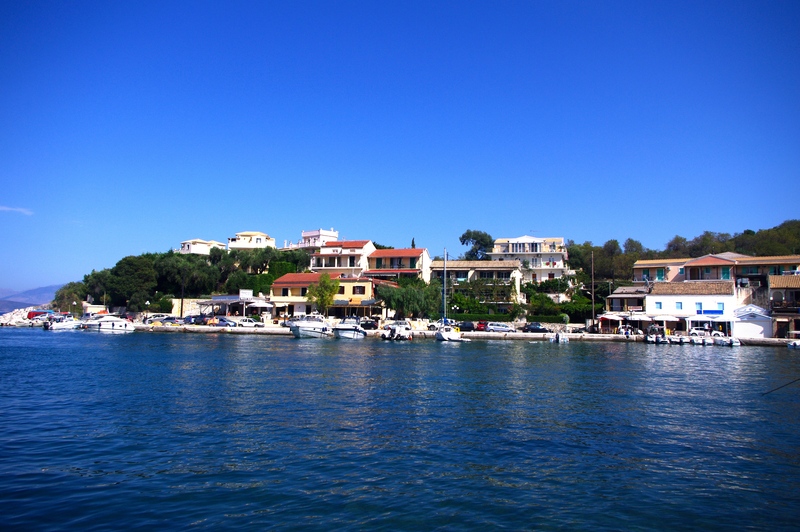 Although Monganisi and Gaios on Paxos are also beautiful, Ryan and I were aching for the wonderful full English breakfast on offer at the Harbour Lights Taverna. We also enjoyed a delicious dinner at a Taverna on the Town square. Unfortunately the water in Lakka was still affected by high season, and not as clear as usual. However, it still kept that beautiful turquoise colour in the middle of the bay. I think Chris and Micheline were still suitably impressed, but their favourite location did not arrive until the end of their trip on board Sibia… More about that coming soon.